It was a warm day in July, perhaps 2004 or 2005. The sky was clear, winds light. A perfect day to hike, and a perfect day to scout a route for the class I planned to teach for the Yellowstone Institute a few weeks later. I woke early, loaded pack and water into the van and drove south into the park to Canyon. I turned into the Wapiti trailhead and began hiking the path south. Signs were posted to warn hikers to avoid an area where the Hayden Pack of wolves were denning. Of course, I had no intention of going anywhere near their den. I wound my way up and down the hills into Hayden Valley, finally stopping at the edge of a small creek well beyond the closed area. My choice, if I were to remain strictly on the trail, was to ford the creek, then ford back after a few hundred yards. This struck me as a waste of shoes off and shoes on time. I considered my future hikers and decided to avoid the double ford by skirting the edge of the creek, then making my way back to the official trail. I hiked on, stopping after a few moments to lay my map out on the ground, orient it with Mt Washburn ahead and, just for the fun of it, pinpoint my location on the map. With my head down, focusing on the map, an odd feeling came over me—as if I were being watched. I looked up to find a white wolf regarding me from perhaps 20 yards away. Surprised, I put map and compass away and grabbed my camera expecting that she would take off as soon as I moved. I snapped a photo, put the camera away and considered her. She seemed to be slowly heading toward my right. I decided to stand and walk toward my left to give her space. I was shocked when she turned toward me and began a sort of bark howl, which, at that point in my career, I’d never heard. I had no idea of its meaning, but she sounded agitated. I tried going left and she came toward me. What is she doing? Calling to pack mates? Am I in danger? I remembered what I knew about bear safety….. if it works for a bear, would it work on a wolf? I grabbed my bear spray and looked for a branch… it is difficult to find any sort of a long branch while in a field of sagebrush. Finally I managed to find a short gnarled limb of sagebrush. I brandished it in one hand over my head to try to make myself look large. Holding the bear spray in the other hand, I called: “Bad wolf”!… “No”! … “Bad Wolf”! It occurred to me that I would not be finishing my hike today and so I turned and headed back, all the while looking over my shoulder and waving the branch. She followed at a distance, still bark howling. I came to the edge of the creek and thought of elk: when an elk is threatened by wolves it will run into water, which is more difficult for a wolf’s shorter legs to maneuver. So that is exactly what I did: boots and all, I waded right into the creek and crossed to the other side. As I returned to the trailhead, I realized (I was a slow learner then) that she must have been protecting her litter. Unbeknownst to the park service or to me, she had moved her pups to a more central rendezvous site. I returned to the Canyon Visitor Center and immediately called the wolf office. I told Deb my story and she said: ‘Yes, we know’. I said ‘no it just happened!’ and she said ‘yes, we know’. Apparently, miles down valley, scopes were out, focused on this crazy woman waving a stick while being followed by a white wolf. Someone had cell service, thought I was purposely invading the pack’s territory and called the wolf office. One of my most embarrassing moments, certainly. But one of my most memorable and special of Yellowstone experiences. I think of her today as I learn that her daughter, the white alpha female of the Canyon Pack has died at age 12. I miss them both. 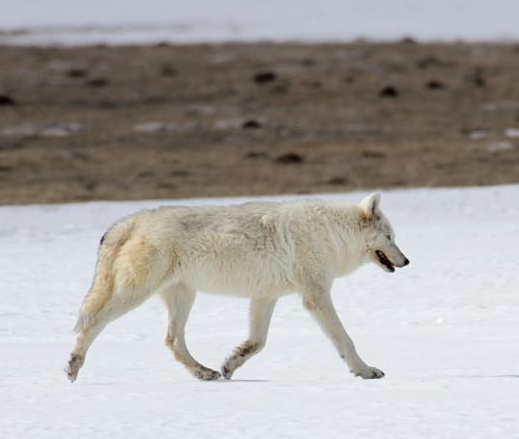 But while I feel the human emotion of loss, Yellowstone wolves continue to go about their business. And a granddaughter, the white alpha female of the Wapiti Lake Pack, carries the legacy forward. What an experience that must have been. Thankfully you read her signals, and gave her the space she was asking for. Yes it was an amazing experience, Mary. I am glad I could give her the space she needed, glad I left the area quickly. Thanks, Marcia. Maybe it will have to be a compilation of various writings and blogs…. I hope you are having a great spring and look forward to seeing you in Yellowstone this summer. What a fantastic story, thank you so much for sharing. Thanks, Tracy! it was a pretty amazing experience, one I’ve carried for years. I am glad, so glad that it happened. Oh, my. My thoughts are all jumbled. I was right there with you, absorbing every instant of your time shared with her, but then jolted out of the wild to learn you were “caught on film,” as it were, by fellow humans. 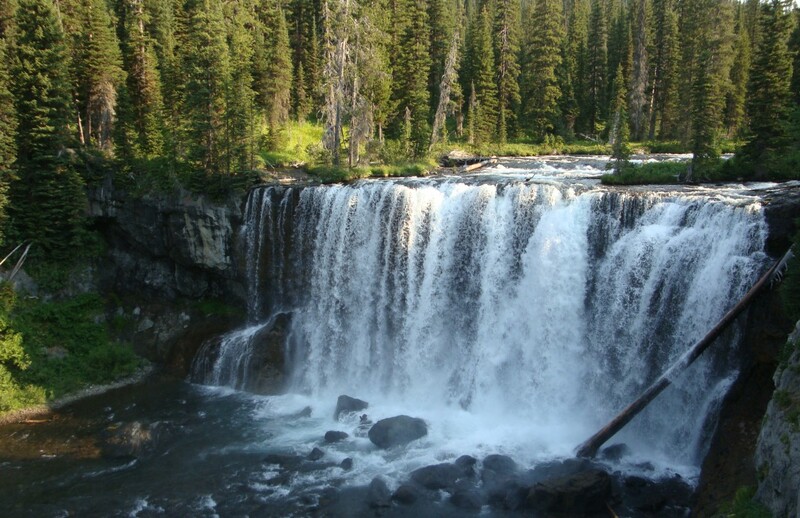 How strange is Yellowstone and so many wild places with scopes and cameras and GPS and jets flying over and satellites and other debris creating nested doll of technology around the wild core. I envy you this experience, as I cling to my own memories of wolf encounters. Thank you, my dear, for writing this and sharing it. And I’m with Marcia…I hope you create a book. And now, I will take a slow morning walk, not wanting to inhale too much or too deeply of the smoke from a wildfire that’s been burning/smoldering? to the east since yesterday. On a hot, windy day…no lightning for months and months, so we know how it began, don’t we? We humans need to get back to our own wild core, so we can protect and preserve. As I said…jumbled. Thanks for your comments, Neysa. It took me a few minutes to decide whether I wanted to include the ‘other’ scopes/people. But, this is Yellowstone. People watch the critters…..
You had me laughing out loud at the scopes set on you! And in tears at the end. Beautiful. Thank you, Sheri. I reached my goal, then! What a beautifully written post Julianne. 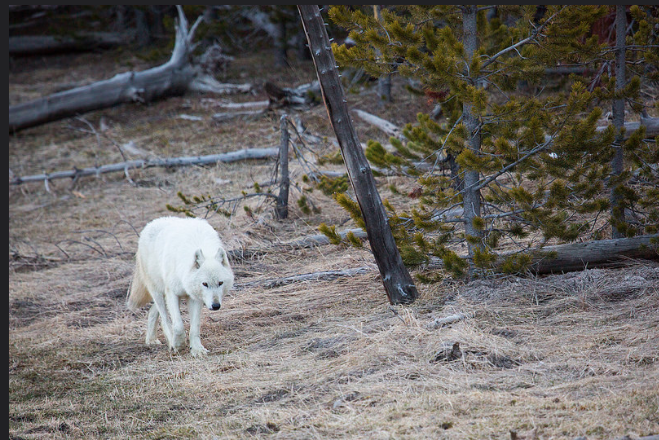 Terry and I were just going back through some old photos this past week and came across some of a white wolf we had taken while in Yellowstone several years back. It made us wonder which pack this beauty may have belonged to. Thanks , LuAnn! I’m thinking your white wolf would have been Hayden or Canyon Pack if it’s a while ago. The Baffin Island Wolf can be that white with less primal markings defined. The Siberian Wolf isn’t quite so white. Dybowski subspecies. Others, such as canis lupus tundrarum aren’t nearly so white… A wolf-dog hybrid does the yelpy, bark-howl. When a wolf is warning a person, he or she will growl, head lowered, tail tucked, or he or she will do the wolf version, a whoof! .. Those short, sharp whoofs are unmistakable! … Anyone should know that means, “Back off, buster!”… Thanks!